"Obviously this part of the war has never received the attention of the Eastern Theater where Lee's Army of Northern Virginia dueled the Army of the Potomac, so there is something intrinsically interesting about finding out more about what was happening out West." "Well illustrated with artwork, photos (including pictures of Civil War relics) and maps." While Lee's Army of Northern Virginia dueled the Army of the Potomac, other Union and Confederate armies were struggling for control of Tennessee. Using eyewitness testimony, profiles of key personalities, period photographs, illustrations and artifacts, and detailed battle maps, author James Street has written an outstanding account of this lesser known chapter of Civil War history. The struggle for Tennessee was a war of maneuvers that began in April 1862 and ended on January 1863 with the Stones River Campaign. Of the major battles of the Civil War, Stones River had the highest percentage of casualties on both sides. Although the battle itself was inconclusive, the Union Army's repulse of two Confederate attacks and the subsequent Confederate withdrawal were a much-needed boost to Union morale after the defeat at the Battle of Fredericksburg, and it dashed Confederate aspirations for control of Middle Tennessee. 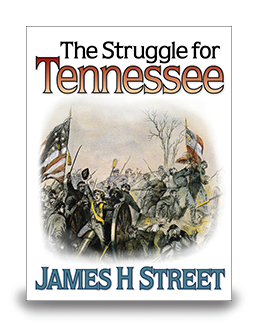 The Struggle for Tennessee: Tupelo to Stones River is the second of the volumes in the Time-Life Civil War series, published in 1985, dealing with the Western Theater of the war after the Battle of Shiloh. All readers interested in the history of the Civil War will be captivated by this superbly written and carefully researched account. Because of the extensive use of illustrations, photographs, and maps, this book is unusually large and difficult to download. For that reason, we have divided it into five manageable chapters. Purchasing any one of these chapters entitles you to a code that will allow you to download all four of the other chapters for free. --Chapter 4, The Fight for "Hell's Half Acre"